During the many years of its existence, our organisation has often worked in partnerships – strategic and programme partnerships, long-term ones, as well as those linked to particular activities or projects. 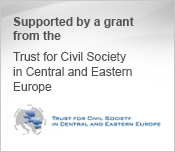 In the critical moments of Slovakia’s most recent history our organisation was actively engaged in numerous initiatives shaped by non-governmental organisations in order to enforce democratic principles in the process of transition to democracy and reforms. The Občianska kampaň ´98 project (Civic Campaign ’98, also known as OK’98) we ran during a pre-election period at the end of 1990s and the Initiative for a Good Law on Access to Information, launched in 2000 and still running, are perhaps among the most important. Later we established natural partnerships and alliances with organisations advocating public interests, the right to equality and women’s human rights in particular. Our members, Janka Debrecéniová and Šarlota Pufflerová, actively work in the government’s advisory bodies – the Government Council for Human Rights, National Minority and Gender Equalities and some of its committees (Gender Equality Committee, Committee for Human Rights Research, Training and Education).